The Northwest Colorado Community Health Partnership (NCCHP) consists of community and safety net organizations, health care providers and government agencies in Grand, Jackson, Moffat, Rio Blanco and Routt counties. The Partnership's mission is to develop a regional network of care for Northwest Colorado to include oral health, behavioral health, health promotion, disease prevention, chronic disease management and acute care for all age groups. We have maintained NCCHP since its inception by providing fiscal sponsorship and backbone support. 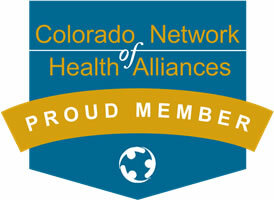 NCCHP members include Grand County Rural Health Network, Middle Park Medical Center, Mind Springs Heath, Northwest Colorado Dental Coaltion, Northwest Colorado Health, Pioneers Medical Center, Routt County Department of Human Services, Steamboat Medical Group, Steamboat Springs Family Medicine, The Memorial Hospital, Yampa Valley Medical Associates and Yampa Valley Medical Center. For more information on NCCHP, please contact Community Partnerships Coordinator Ken Davis at 970-871-7647. The 2012-2016 Community Health Improvement Plan for Routt and Moffat counties is a roadmap for improving public health in key priority areas. The plan provides the background and process for the Colorado Health Assessment and Planning System (CHAPS), highlights findings from the community health assessment, outlines the process by which the public health priorities were chosen, and describes the goals, objectives and action plans for each health priority area.